Boy, does Gearbox love dragging out character reveals for their upcoming MOBA. By my count, the Texan studio have now announced precisely 176,000 figters for Battleborn, even if the official roster is only a ‘mere’ 25. Now the final two combatants have snuck out in the form of a preposterously muscled Mexican wrestler and a badass, geriatric scientist. Battleborn’s style of first-person combat certainly looks intriguing. Will it match up to the best FPS games on PC? The aforementioned wrassler is called El Dragón, while the OAP man of science is named Kleese. 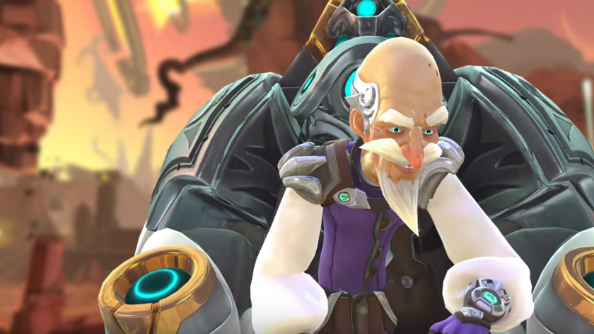 Honouring Battleborn’s gloriously silly premise, the two fighters enjoy quite the eclectic set of moves, as a couple of freshly released trailers reveal. M-RBX Cybernetic Arms – launch a flurry of punches, a big ol’ clap and a devastating clothesline. Dragon Splash – crush your enemies from above. En Feugo – Explode and empower ElDragón’s attacks. Wrist Cannon – unleash rapid energy blasts. Shock Taser – quickly take down shields. Energy Mortar – launches a barrage of mortars. Energy Rift – restore friendly shields and damage enemies. Black Hole – pulls in enemies and deals damage. Battleborn launches on PC on May 3rd. Prepare yourself for a whole lot of whackiness.